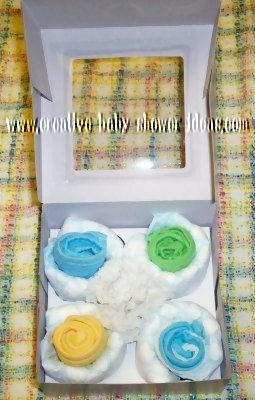 Our diaper cupcakes photo gallery was compiled to help give you ideas to make a diaper cupcake for your next baby shower. ***Note*** All photos in our gallery have been submitted by readers like you. 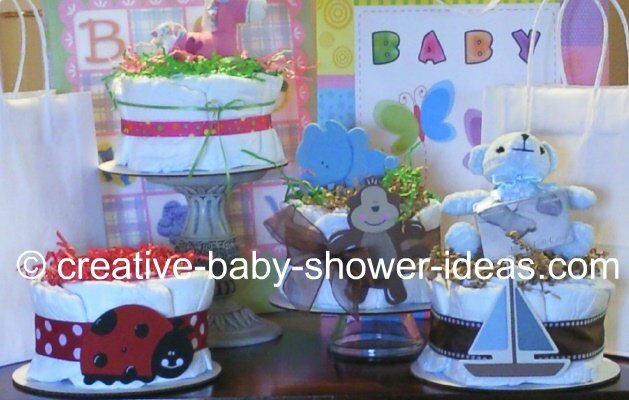 They have been sent in to help you make a fabulous diaper cake! This personalized cupcake was so cute! I needed something little to go with the diaper cake I made for my daughter's baby shower. First - I bought a burp pad and had it personalized. Second - I rolled 3 diapers for the middle & secured them with a rubber band, you could also use a toilet paper roll for the middle. Then I rolled enough diapers to go around the middle section (if you use a larger size diaper, you won't have to use it as soon). Third - fold the burp pad to the need height. Cut 2 lengths of curly ribbon long enough to go through the folds at top & bottom. Tie bow in the back & curl ribbon. Fourth - I used a clear plastic plate that I secured to a candle holder with double-sided tape. Next I used double-sided tape to secure the diapers to the plate. 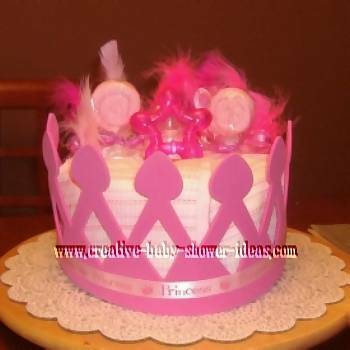 Fifth - Decorate around the bottom & top with crinkle cut paper. Also I added a little curly ribbon on top. It turned out adorable & didn't take long at all to make. 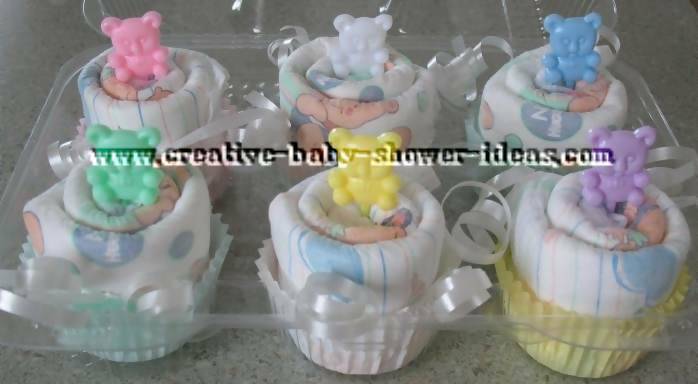 These diaper cupcakes were made with 9 diapers. 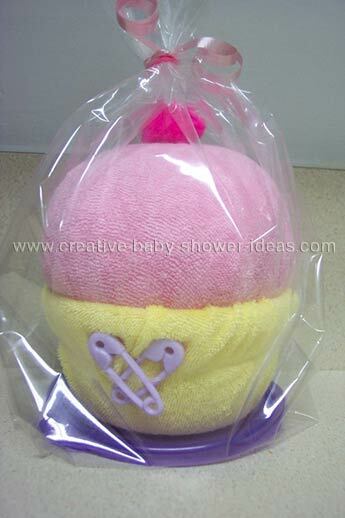 The ribbon color can vary as well as if you want to use washclothes or flowers. 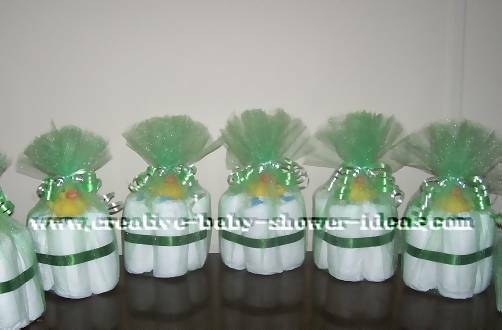 These diapers are tightly rolled, secured around the centers with ribbon, placed in cupcake containers and finished with teddy bear pics. 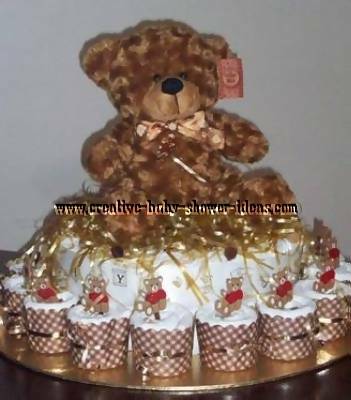 This is my first diaper cake. I searched many sites learning how to do it. An associate of mine saw it and purchased it. So I have made a few more all with the flower theme since I have not been successful with other designs. Once I master a cake without the floral design, I will send it along. But for the first one, I don't think it turned out too bad. I took a snack cup and used it for the bottom of the cupcake. OI then took a baby washcloth and covered it. Inside i placed assorted baby items. 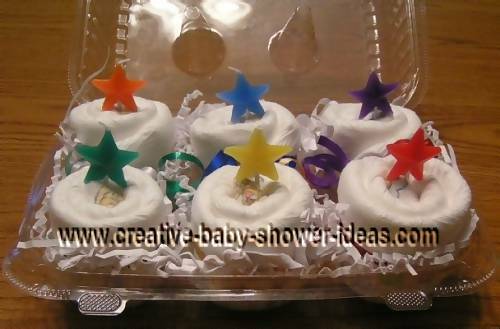 For the icing part, I used a soft baby ball and wrapped diapers around it. 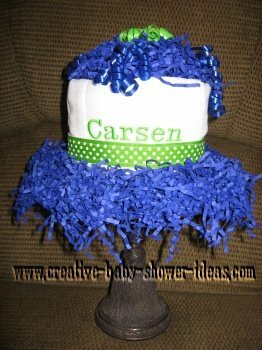 Then took another washcloth and tied it around the diaper ball. I placed the ball on top. I used the lid to the cup as it's plate. This is a diaper cake I made for my husband's cousin! 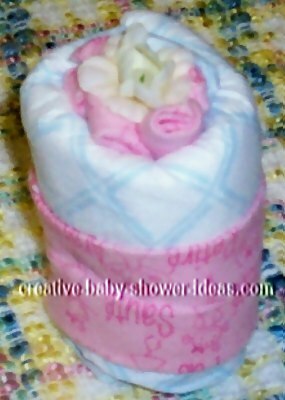 I love making diaper cakes! I am just trying to get my business started!My company is Diapers By The Slice. 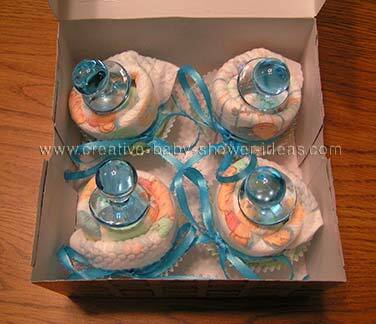 This is a set of fun diaper cupcakes...these diaper cupcakes each have baby powder hidden inside. 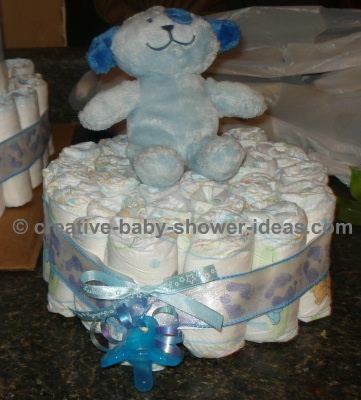 I made a 1 tier diaper cake with my left over diapers, i added "its a boy ribbon" used curling ribbon to hold the pacifier tied it to the Its a boy ribbon. and added a bow out of Lullaby ribbon. placed the Dog on top and held him down with floral wire wrapped around his leg down the diaper and hooked it into the bottom. It was easy and very simple design. 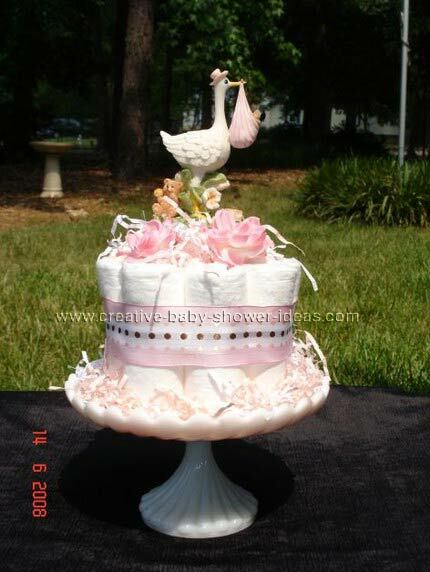 Here are a couple more nappy cakes I have made. I made this one with a friend in mind. She loves jewelery so I assume her daughter will too! 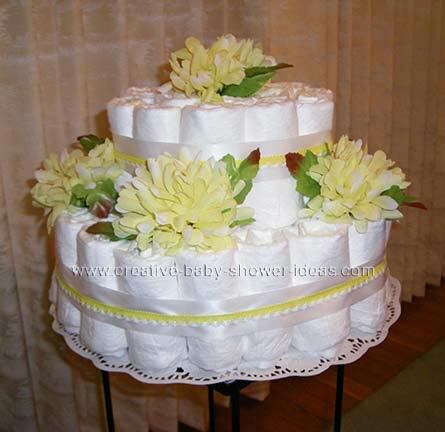 I made it a couple of months ago thinking that it would just be a cupcake (diaper cake.) But half way through I came up with the jewelery box part. It's actually pretty easy to make, even though it sounds complicated. The trick to the music is using one of those musical greeting cards and strategically placing it (or part of it) in a position so that when you open the lid, it triggers it to play music! This has been one of the more whimsical diaper designs to date. A lot of fun to make too!